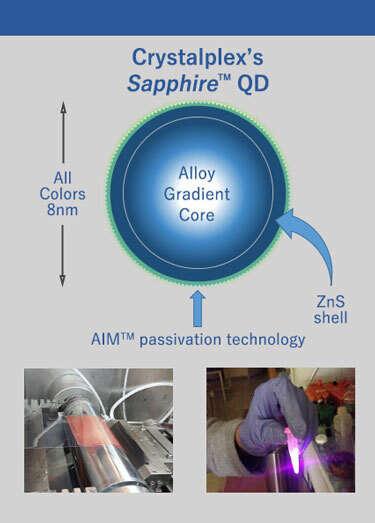 Development of a Highly Stable and Thermally Processable Sapphire™ Quantum Dot Polymer Matrix Using a Two-Prong Approach. Click on the thumbnail to read more. Crystalplex is a nanotechnology company with the world's first and only alloy gradient quantum dots (QDs) for the optoelectronics industry. The proprietary technology in our SapphireTM QDs provides a stable crystal design, flexible polymer matrix morphology, and meets environmentally responsible yet demanding performance requirements for high-end consumer electronics applications such as LCD TVs, displays, and high-CRI architectural lighting. Crystalplex, a Pittsburgh company, was founded in 2004 as a biochemistry and diagnostics laboratory, specializing in nanotechnology for the life sciences industry. In 2009, the company directed its research to optoelectronics and developed high-performance nanocrystals for photoluminescent, electroluminescent and photovoltaic applications. 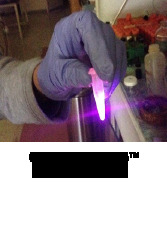 As a result, Crystalplex has developed he world's first and only alloy gradient SapphireTM quantum dots (QDs) for the optoelectronics industry. Our proprietary, environmentally responsible technology produces stable QDs adaptable to an array of polymer matrix applications that meet demanding performance requirements for high-end consumer electronics such as LCD TVs, displays and high CRI architectural lighting. Lianhua Qu, Ph.D., is the Chief Technical Officer of Crystalplex Corp. Dr. Qu is a recognized leader in the development of fluorescent nanoparticle technologies. He holds a doctorate in physics from Jilin University in China and conducted post-doctoral research at both the University of Arkansas and Emory University. He holds four patents in nanocrystal technology with a number of new applications pending for recently developed nanocrystal synthesis. Matt has a 25 year career in nanomaterials and biomaterials research, product development and manufacturing. In the past Matt has developed and commercialized medical devices, infection control devices, medical polymers with engineered surfaces and products for the controlled release of volatile substances. He has been a co-founder of four companies, two of which have had successful exits. His academic research focused on the application of biophotonics and biophysics in the study of cancer cells. His keen interest in the physiology of human vision and color perception is a driving force at Crystalplex. Matt holds 12 patents and has B.S. and M.S. degrees in Cell Physiology from the University of California at Santa Barbara. Dennis is currently the Director of Laboratory Operations at Crystalplex Corp. He holds a B.S. degree in Nanofabrication Manufacturing Technology (Chemistry) from California University of Pennsylvania. He also has a Certificate of Nanofabrication Manufacturing Technology from Pennsylvania State University. 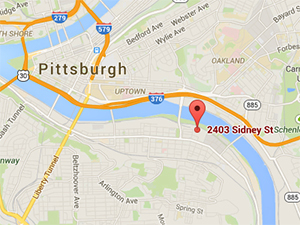 PITTSBURGH, September28, 2016- Crystalplex Corp. today announced the U.S. Patent and Trademark Office (USPTO) issued U. S. Patent No. 9,425,253, "Passivated Nanoparticles," assigned to Crystalplex. The patent, which claims the fabrication and use of Sapphire™ quantum dots, or passivated quantum dots with improved stability, was granted to inventors Lianhua Qu and Gregory Miller. 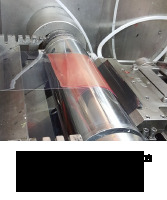 The patent is directed to processes for synthesizing an alloy gradient nanoparticle with a Zn:S shell and an outside coating of aluminum oxide that provides a barrier to environmental degradation. In addition to providing improved photo, thermal, and environmental stability, the quantum dots demonstrate longer lifetimes, as the optically transparent aluminum oxide outer layer serves as a shield against degradation by humidity and oxygen. 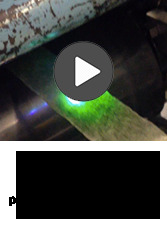 The passivation technology is applicable to Crystalplex's alloy gradient cadmium-free quantum dots, as well. Crystalplex Corp. is a private firm with 12 years of R&D directed to quantum dot technology. 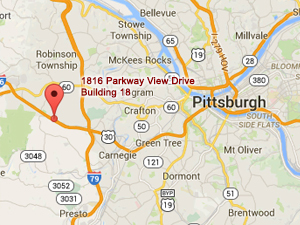 The company maintains a fully integrated synthesis and pilot application plant in Pittsburgh, PA, USA.